At a glimpse: Researchers at the North Willamette Research and Extension Center initiated an experiment to study the effect of container type – plastic or fabric – on shade tree root growth. For the past two years I have researched the production of shade trees in large containers. The objective of the research was to determine the pros and cons of using fabric versus plastic containers. The results of that research are forthcoming: however, I would like to share an important side observation. We found that the manner, in which trees are potted, regardless of container type, had a profound effect on root development. This article will discuss a few topics on root growth, describe some of our research, and make recommendations for root pruning of barefoot trees potted in large containers. Researchers at the North Willamette Research and Extension Center initiated an experiment to study the effect of container type – plastic or fabric – on shade tree root growth. The physical structure of roots has received a lot of attention within the green industry over the past 5 years. Whether it’s just our perception or reality, most in the green industry prefer trees with a well developed, balanced, and highly branched root system. There is a perception that a fibrous root system with perfect radial symmetry will grow and establish more readily than a coarser root system. In reality, the physiological growth potential of a root system is probably more important than its physical structure. This is especially true for a tree that is dug, moved, and replanted in another area. 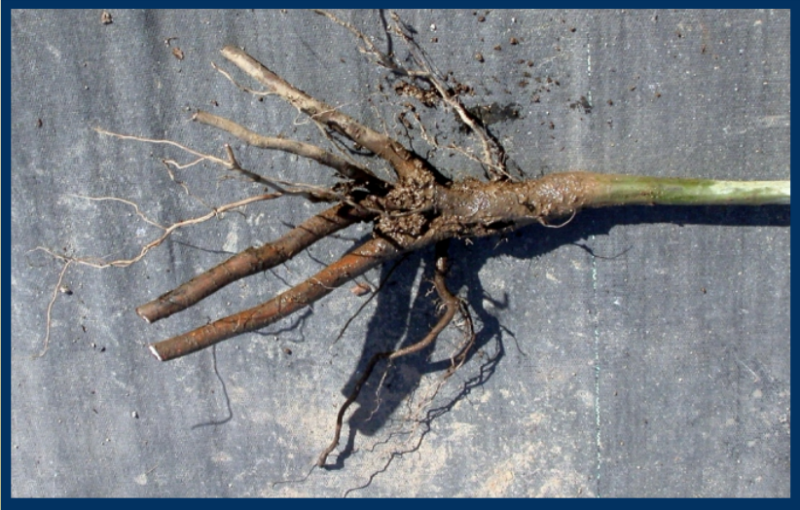 Root growth potential is dependent on stored carbohydrates, stored nitrogen, and proper root moisture content of the root system, which cumulatively would promote a strong flush of new roots in the spring. These chemical and physiological properties of roots are determined by the production and storage practices it received the previous year. Proper nutrition and irrigation regimes, followed by proper digging time and storage conditions will provide a vigorous root system with good growth potential the following spring. While I believe root growth potential is most important, there are some physical abnormalities in root systems that can be damaging. Circling roots of trees grown in plastic containers, such as this pin oak on the right, may become girdling over time. The tree on the left was grown in a fabric container. Bare root shade tree growers systematically discard misshapen roots. One of the great benefits of using bare root trees is that the root system is on display for all to see, including the customer, so quality in terms of physical structure is very high. Poor root structure in container-grown plants is more difficult to see. There are some physical abnormalities that are common in container production and should be discouraged. The three primary problems I’ve seen with container-grown trees include girdling roots, circling roots, and misdirected roots. Girdling roots are those that grow across the rootball and in close proximity to the tree stem or root collar. The root collar is the region at which the tree stem transitions to the root system. With age, girdling roots can strangle the stem or root collar. For a root to become girdling, it would most likely have to occur near the soil surface where growing into the stem would cut off water flow from the root system. If the root were several inches or more below the soil surface, the root may girdle or graft with another part of the root system, but have relatively little effect on water and mineral transport. The root collar (or stem) is the bottleneck for the entire root system. All water and nutrients from the root system must pass through the root collar. If the root collar is ‘strangled’, the entire tree might die. If one or several roots below the soil surface are girdled (which in effect would be similar to root pruning) the tree develops new roots and life goes on. Circling roots are those that grow in a circle, usually as a result of the shape of the container. Ideally, tree roots would grow out in all directions from the center of the tree. Circling roots that occur several inches or more beneath the soil surface are not desirable, but also less of a concern than those near the soil surface that could ultimately girdle the tree stem or root collar. Misdirected roots are those that grow in seemingly the opposite direction they should. Again, root systems originate at the root collar and ideally grow outward in a relatively symmetrical pattern. Sometimes, growing conditions in the container will force roots to grow inward and toward the root collar. These misdirected roots are probably more problematic than circling roots in terms of girdling potential. Circling or misdirected roots may have little impact on tree establishment; however, they can have serious negative consequences later in the tree’s life. Ronald Zillmer, Associate Dean of Mid-State Technical College, observed that tress often die when tree caliper grows to the same diameter as the original container. It was speculated that circling roots in the container ultimately become girdling as the tree grew out to and past the original container diameter. Because root structure is important to long-term tree health, we set out to determine if alternative container types affect container root quality. We used bare root shade trees planted in large containers as the model for this work. In the interest of full disclosure, local nursery growers and representatives of High Caliper Growing, who were interested in finding this research to compare their root control bags to standard plastic containers, contacted me. The project started by potting bare root shade trees (10 species) into plastic or fabric containers to evaluate shoot growth, root development, and water loss characteristics between the two container types. After one year of research, we bare rooted ½ of the trees in each container type and species to evaluate their root growth. We found that some trees had very odd growth or misshapen root systems, and this was most often caused when roots from the trees were touching the sidewalls of the containers at the time of potting. Container nurseries that grow shade tress most often use bareroot trees locally grown in Oregon. At potting, the bareroot tree is root pruned lightly and shoved into the container. There are sound arguments for light root pruning. A larger root system will be more stable in a recently potted container. Furthermore, larger root systems are presumed more vigorous than smaller root systems. In the first year of our research comparing fabric and plastic containers, we had no predisposition for pruning the roots in any particular way. On average, they were pruned so they fit comfortably in containers. As a result, some were touching the container wall at the time of potting and some were not. Roots that were touching the container wall at the time of potting developed new roots that grew back towards the container center. Misdirected roots could cause problems for trees establishing in the landscape. Some of the red oak trees developed heavy callus where roots were contacting the container wall. Because root pruning was not a treatment in this experiment, it was difficult to draw any substantive conclusions from our observations. So we made plans for the following year to follow up on these observations with a replicated experiment. This study was initiated to evaluate the effect of container type (fabric or plastic) and root pruning (light or severe) on subsequent root growth. In the light pruning treatment, roots were only pruned enough so that they could be potted with roots touching the container wall but not bending against it. In the in the severe pruning treatment, roots were pruned so that all root tips were at least 2 inches from the container wall. We evaluated container type and root pruning severity on ‘Franksred’ red maple (Acer rubrum), pin oak (Quercus palustris), and ‘Autumn Blaze’ ash (Fraxinus Americana). Bareroot whips with one-year-old tops were obtained from a local nursery and potted in 15-gallon containers and an equivalent size fabric container. Trees were potted in 65% Douglas fir bark, 15% peat, and 20% pumice. After digging, storing, and pruning, bareroot shade trees typically have several primary roots with relatively few fine roots. The primary roots are relatively thick, and would have been pruned either by the digging process or secondarily by the work crews that grade and bundle the trees. For the trees species used in this experiment, and most tree species to my knowledge, new roots emerge from primary roots at or near the pruned root tip. If trees were planted in an open field, roots would emerge from the pruned tips and grow out away from the tree. Across the three species tested in this experiment, roots in fabric containers had fewer circling roots compared to plastic containers. When roots were pruned so that they were not touching the fabric at potting, new roots emerged from the pruned primary root tips and grew to the container edge. At the container edge, these fine roots were pruned by the fabric material, and forced to branch into a very fibrous root system with little or no circling. When primary roots were touching the fabric container at potting, roots emerged and in many instances grew back in towards the tree trunk or container center. Some new roots emerged and immediately began circling. One of the primary benefits of fabric containers is that they typically provide a more branched and fibrous root system, with no circling, girdling, or misdirected roots. However when roots are pruned at potting such that they are touching the fabric containers, the ability of the fabric to function as such is severely compromised. Plastic containers responded similarly to fabric containers, in that circling and misdirected roots were more common when root system was pruned such that the root tips were touching the plastic at potting. 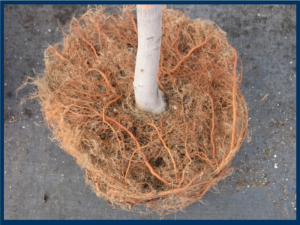 All tree species tended to develop circling roots in plastic containers, regardless of root pruning treatment. However, the relative amount of circling roots was greater in containers in which roots were only lightly pruned. In general, root systems in fabric containers were superior to their plastic counterparts. This was seen primarily as a function of more fibrous root systems with far fewer circling or misdirected roots. Root pruning prior to potting had a profound effect on root growth in both container types. Optimal root development from bareroot shade trees is a function of many things. One very important factor is the proximity of the pruned root tips to the container wall they are potted in. Because new root formation occurs near the pruned root tips, bareroot trees should be pruned (their root system) so that the root tips are at least 2 inches from the container wall. This would probably be true for any container type, and especially true for fabric containers.